16 Pack of Premium Compatible Brother LC123 Ink Cartridge Multipack. The Brother DCP J752DW is a multifunction inkjet printer that is capable of printing, copying and scanning. It can produce black and white as well as coloured outputs. It is capable of automatic double sided printing and has excellent connectivity options. It is a great choice for SOHO users. The Brother DCP J752DW weighs 9.0 kg and it is 410 mm in width, 374 mm in depth and 180 mm in height. It has a printing speed of 27 ppm in case of colour and 33 ppm in case of black and white. It has a maximum printing resolution of 6000 x 1200 dpi and scanner optical resolution is 1200 x 2400 dpi. Its copying speed is 6 ipm in case of colour as well as black and white and the copying resolution is 1200 x 1200 dpi. It can produce a maximum of 99 copies at a time. The Brother DCP J752DW Ink Cartridges are high yield cartridges. It has an in-built non-expandable memory of 64 MB. It offers both wired and wireless connectivity options. It has a 6.8 cm colour LCD touchscreen for controlling the printer. It has a 100 sheet input tray, a 20 sheet automatic document feeder and a 50 sheet output tray. It produces a sound emission of 50dbA. Brother DCP J752DW is a colour inkjet printer that is very cost-efficient and the Brother DCP J752DW Ink Cartridges have high yield. It has low power consumption and requires no warm up time. It is capable of duplex and borderless printing. But it has limited paper handling capacity and does not support large sizes of paper. Also it has a limited memory which cannot be expanded. Q. What should be done if the drum unit of an ink cartridge gets damaged? For how long does a drum unit work? A. You need to take proper care of your printer’s drum unit also just like you do for cartridges and printing machine. If a drum unit gets damaged, errors in printing tend to come up. It is recommended that a drum unit should be changed after you have replaced your ink cartridges around three times. Q. Would you recommend Brother DCP J752DW ink cartridges suitable for photo printing? Also, if I want to print heavily pix-elated graphics, will the cartridges get exhausted earlier? A. These Brother ink cartridges are very proficient at photo printing besides producing text documents of high quality as well. Printing heavily pix-elated graphics consumes more ink, so yes, the cartridges get exhausted sooner than they would while printing regular images. Q. I’m interested in buying a multipack of 20 Brother DCP J752DW ink cartridges which I saw on your site but first I’d like to know if all the cartridges will be good in quality and if you give money-back guarantee if they are returned. A. Yes, please be assured every cartridges in all our multipacks is top quality as each one is put through the strictest tests. We also provide money-back guarantee on all multipacks besides single units. Q. Any free cartridges on purchase of Brother DCP J752DW ink cartridges multipacks there??? A. Yes, on an 8 cartridges pack of this model, you get two free cartridges and on a pack of four, you’ll get one free. Q. Why does Brother DCP J752DW ink cartridge print more pages when installed in some printers than in others? Are the cartridges that print less pages defective? A. The number of pages that most cartridges print tend to vary a little with the printer model in which they are installed. There’s no defect in the cartridges that print lesser with some printouts; it’s just a common feature found in most cartridges. Q. How many pages can Brother DCP J752DW ink cartridges print? A. Both, original and compatible Brother LC123 ink cartridges can print up to 600 pages without having to be replaced. Q. What devices can I use with my J752DW for printing? A. Brother DCP J752DW is capable of printing from PictBridge enabled cameras, USB Flash Memory Drives, Memory Sticks, SD Cards, Multimedia Cards, mobiles/tablets and computers. Q. What is the quality of the printouts produced by the Brother DCP J752DW printer? A. 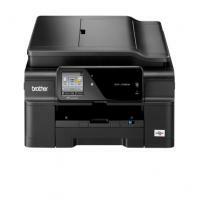 Brother DCP J752DW printers can print up to a resolution of 6000 x 1200 dpi. A. You can use the CD-ROM that came with your printer or you can download the printer drivers for your printer from here. Follow the steps given in the Quick Setup Guide to avoid any confusion while installing. Q. Is Brother DCP J752DW suitable for home purposes? A. This printer is good for home purposes since it comes with copying as well as scanning features. It can also connect to the Wi-Fi and print from multiple devices, but the Brother DCP J752DW can get a little noisy, which may cause inconvenience to some users. Q. My Brother DCP J752DW has run out of black ink. Can I buy black Brother DCP J752DW ink cartridges separately? A. Yes, we provide individual packs of all Brother DCP J752DW ink cartridge colours. We also provide multipacks with all the colours for long term savings. Q. What operating systems are supported by this printer? A. Brother DCP J752DW runs well with all versions of Windows and Mac OS. Q. Do Brother DCP J752DW ink cartridges come with a warranty? A. Yes, we provide a no risk warranty on all our products. All Brother DCP J752DW ink cartridges are warranted to be free from any defects. If you face a problem with any of our products, you can contact us on 048 308332211 or email us on info@printerinkcartridges.ie.